The COOL Cuisine Burger Battle wrapped up March 31 with an amazing 5,110 plant-based burgers sold according to event organizers. That’s an average of 161 burgers per day. Compared to consuming that many beef burgers, diners together prevented 15.5 tons of greenhouse gas (GHG) emissions and saved 3 million gallons of water. Meat consumption is on the rise worldwide according to the World Resources Institute. 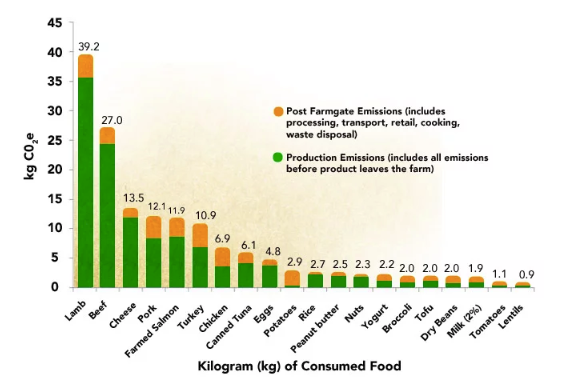 But beef and lamb, in particular, have a huge environmental footprint, emitting 27kg and 40kg of CO2 respectively per kilogram (2.2 pounds) consumed. Most of us are aware that a diet heavy in animal products contributes to a host of “first world” diseases such as obesity, diabetes, and heart disease. For those who don’t want to give up the taste of meat, meat substitutes are catching fire in the food industry. Going meatless on Mondays or pledging to eat beef only once a week also has a huge impact. At the local level, progress is happening. COOL Cuisine and other groups meet regularly to try vegetarian and vegan options at homes and local restaurants. The highly successful Burger Battle may be held again in the future. Help reverse the trend and reduce your meat intake just a few times a week or month. For more information, visit the Cool Davis Plant-based Eating webpage, the Cool Davis news blog or the COOL Cuisine web page. Most of us are mindful that automobiles emit greenhouse gases, and we try to limit our driving when possible. But you may be less aware of the environmental impact of our food choices. As the graph below illustrates, meat and dairy consumption comes with a much higher carbon cost than plant-based diet alternatives. By choosing foods at the right side of the graph, you can significantly reduce your personal carbon footprint. Full Lifecycle Greenhouse Gas Emissions from Common Proteins and Vegetables. Copyright © Environmental Working Group, www.ewg.org. Reproduced with permission. Consider the carbon cost of consuming a kilogram (2.2 pounds) of beef, an amount a family can easily consume in a single meal. The production of that meal’s worth of beef is responsible for adding 27 kg (60 lb) of CO2-equivalent greenhouse gases (CO2e) to the atmosphere. Reducing or eliminating meat from our diets can have a significant beneficial impact on the environment. Calculations in the online journal Mathematics for Sustainability, published by Penn State University, show that eliminating meat just one day per week can save one ton of CO2e gases annually, equivalent to the greenhouse gas generated by driving about 2000 miles. Other environmental impacts of meat production are equally eye-opening. Meat production requires raising huge amounts of animal feed, which in turn necessitates the application of huge amounts of fertilizer, pesticides, and water. According to research published in the American Journal of Clinical Nutrition, livestock in the United States directly consume seven times as much grain as the human population. The process of growing feed and raising animals releases nitrous oxide and methane, greenhouse gases that are substantially more potent than carbon dioxide. The livestock industry discharges toxic chemicals and produces tremendous amounts of manure and urine that result in more methane as they decompose and often pollute our air, streams, and ground water. A single large feeding operation can produce as much waste as a small city. Imagine a city producing waste but not processing it in a modern sewage treatment facility. Given the resources used to produce all that meat, the nutritional pay-off is relatively small. A recent study published in Science found that while meat production uses 83% of all agricultural land, it produces only 37% of the protein and 18% of the calories consumed worldwide. Without meat and dairy production, the world could be fed on 25% of the agricultural land currently used. The chart below identifies beef and lamb as contributing the most greenhouse gases to the environment per unit of protein produced. For example, producing 28 gm of beef protein (about the amount in a quarter-pound of beef) releases 2.75 kg (6 lb) of CO2e into the atmosphere. By comparison, producing 28 gm of tofu protein results in only 0.56 kg (1.2 lb) of CO2e gases. 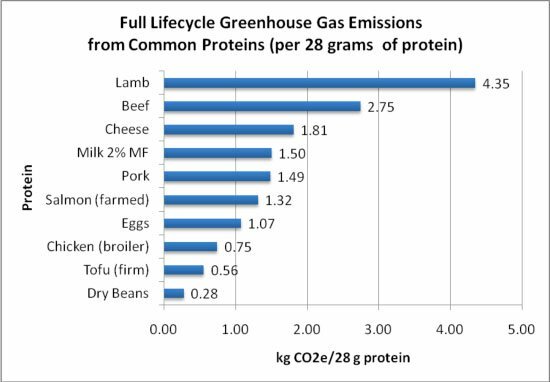 Full Lifecycle Greenhouse Gas emissions from Common Proteins chart here. Copyright © Environmental Working Group, www.ewg.org. Reproduced with permission. Cattle and sheep production releases large amounts of CO2e in part because these animals are very inefficient at converting their feed into meat, requiring more feed to be produced. As ruminants, they also produce large amounts of methane through belching and flatulence. Stored manure produces millions of additional tons of methane annually. A January 2018 article in the New York Times relates that ruminants produce two-thirds of the greenhouse gases attributed to agriculture, making ruminants responsible for about 10% of all greenhouse gases produced in the U.S. Beef production also has other environmental impacts. According to the USDA, producing one pound of feedlot beef requires 2,500 gallons of water, 12 pounds of grain, and the energy equivalent of one gallon of gasoline. Those resources could be used in much more productive ways. The impact of meat production is international. A report published by the Yale School of Forestry and Environmental Sciences estimates that in the Amazon Basin, 80% of the deforestation (174,000 square miles) can be attributed to cattle ranching. That means that cattle ranching in the Amazon has resulted in the loss of rain forest over an area larger than California. Some people assume that the negative impacts of beef production can be reduced or even eliminated by consuming grass-fed beef rather than beef that is “finished” in a feedlot. However, grass-fed beef also has significant negative environmental effects. A 2011 article in The Atlantic explains that all beef cattle in the United States start out eating grass. At about a year of age, feedlot beef cattle are sent off to confinement and a diet high in grains. After about six months they have reached marketable size and are slaughtered. Grass-fed beef, on the other hand, continue on a diet of grass and other forage. It takes them several additional years to reach marketable size. Cows feeding on grass produce more methane than those eating grains because grass is harder to digest. And because the animals take several more years to reach market size, grass-fed cattle produce significantly more methane than those finished in a traditional feed lot. An analysis described in Environmental Health Perspectives, a publication of the National Institutes of Health, found that grass-fed cattle produce 58% more greenhouse gases per pound of meat than the traditional feedlot version. Grass-fed beef production also requires that approximately three times more land be dedicated to cattle grazing. Replacing current beef production with grass-fed beef would require an additional 26 million acres. An article in The New Food Economy states that approximately 80% of the grass-fed beef sold in the U.S. is produced in another country, with Australia and Brazil as the primary sources. As long as a carcass is cut up in a USDA-monitored facility in the United States, the meat can be labeled a product of the United States. This hides environmental impact of shipping from consumers. Some argue that best practices for raising grass-fed beef actually sequester carbon, largely through improved soil health and increased pasture growth. However, a recent study by Oxford’s Food Climate Research Network found that the carbon sequestration benefits could only offset 20% to 30% of the average annual greenhouse gas emissions of grass-fed beef. So, while grass-fed cattle have a longer and no doubt better life than their feedlot brethren, from an environmental standpoint, grass-fed beef is a huge negative. Chicken is a much better choice than red meat from a greenhouse gas perspective since raising a pound of chicken creates about a quarter of the greenhouse gases produced by a pound of beef. But “better” is only relative; raising chickens still produces many times the greenhouse gases of plant-based protein sources. Most chickens eaten in this country are raised in concentrated, massive operations. These are generally windowless sheds, 500 feet long by 50 feet wide, clustered in groups of 5 or 10, each holding thousands of birds. This form of chicken production is highly efficient, and according to the USDA, annual per capita consumption of chicken has increased from 34 pounds in the mid-sixties to 93 pounds currently. However, this approach to chicken production has many damaging environmental consequences. The huge amounts of waste produced from chicken farming include feces, feathers, bedding, and dead chickens. While improvements have been made in sanitary disposal, pollution of air, water, and soil still occurs. Chicken manure is a source of large concentrations of phosphates and nitrogen, heavy metals, trace antibiotics, and hormones. All of these can pollute water, soil, and air, resulting in fish-killing algae blooms, pollution of drinking water, and respiratory disease. As with beef, changing the conditions of chicken production does not solve the inherent environmental problems. While “free-range” may imply better animal welfare, the Washington Post reports that some studies have shown that free-range poultry experiences higher mortality than confined birds. Pesticides, heavy metals, and lead residues may be more of a concern in the products of free-range flocks because of their direct contact with the soil. Free-range production requires more feed, water, and land for a given amount of meat or eggs, and so may actually have a higher environmental impact. Still, eating a modest amount of chicken, small flock, free-range, and local production may be the best option. Unless humans make significant changes in their eating patterns, the environmental impact of meat production will only increase. As reported by the World Resources Institute, the human population grew by 80% between 1970 and 2010, but meat consumption tripled. Meat consumption is projected to double again by 2050. At the same time, interest in eating a vegetarian or vegan diet is increasing worldwide. Many people are finding that plant-based diets are tasty, varied, and rewarding. With some meal planning, a vegetarian or even vegan diet can satisfy all nutritional needs (though vegans may benefit from a vitamin B12 supplement). If a vegetarian diet is too extreme, people can continue to eat meat but just less. This simple change lowers health risks and reduces environmental impacts, and might even save money on grocery bills.